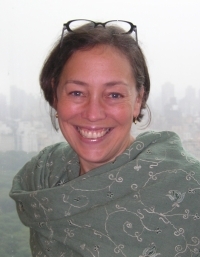 Lise Funderburg is a writer and editor based in Philadelphia. She studied at Reed College and the Columbia University School of Journalism, and her articles, essays, and reviews have appeared in numerous publications, including The New York Times, Washington Post, Philadelphia Inquirer, Salon, The Nation, National Geographic, Garden Design, Cleaver, The Chattahooochee Review, and Prevention. Her latest book is the bestselling social history/memoir, Pig Candy: Taking My Father South, Taking My Father Home (Free Press, 2008). Pig Candy could fit into several genres—including narrative nonfiction, memoir, travelogue, and biography—but essentially, it’s a book about life, death, and barbecue. Pig Candy was selected as the Freshman Summer Read for Drexel University in 2012. Funderburg’s first book was a prescient oral history called Black, White, Other: Biracial Americans Talk about Race and Identity (Morrow, 1994): it was the first book to explore the lives of adult children of black-white unions. Black, White, Other has become a core text in the study of American multiracial identity, and it is used in college courses around the world. Its first chapter was anthologized in Identity Matters: Rhetorics of Difference. In the New York Times review of Black, White, Other, writer Kyoko Mori said that the book “is an example of how we can talk about race with feeling, humor, and dignity.” Funderburg's work appears in numerous anthologies, including Best African American Essays 2010; Live Your Best Life: A Treasury of Wisdom, Wit, Advice, Interviews, and Inspiration from O, The Oprah Magazine; These Hands I Know: African American Writers on Family; 101 Damnations: the Humorists' Tour of Personal Hells; 21st Century Dog: A Visionary Compendium; and The American Civil Rights Movement: Readings & Interpretations.